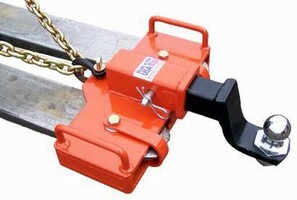 Ball Hitch Adapter lets fork lifts haul hitch equipment. Fork Rhino converts fork lift into equipment handler capable of moving variety of hitch equipment, including ball hitches, goose necks, and pintles. Able to fit forks up to 6 in. wide, solution evenly spreads load over both forks to eliminate fork sag. Product is offered in 4 models - Shackled Fork Rhino, Shackled Fork Rhino Receiver, Pinned Fork Rhino, and Pinned Fork Rhino Receiver - and design does not affect safe operation or capacity of fork truck. Erie, Pa. - Automation Devices, Inc. (ADI) recently released a new version of the Fork Rhino Fork Lift Ball Hitch Adapter, a device used to convert a fork lift into a versatile equipment handler capable of moving a variety of hitch equipment including ball hitches, goose necks and pintles. Designed by Kevin Smith, vice president of ADI, the Fork Rhino allows a user to eliminate the single fork method of moving trailers which can result in fork sag and uncontrolled fork swing. Smith says, "Similar to a trailer spotter, the Fork Rhino evenly spreads the load to both forks eliminating fork sag, yet it's much smaller and lighter than most spotters." The Fork Rhino is one-third the size and weight of most trailer spotters. The latest design fits forks up to 6" wide and the handles have been moved to the top of the device encouraging a higher turning radius and easier storage. There are four different models of the Fork Rhino: Shackled Fork Rhino, Shackled Fork Rhino Receiver, Pinned Fork Rhino and the Pinned Fork Rhino Receiver. The Rhino restraint system locks the Shackled Fork Rhino and Shackled Fork Rhino Receiver into place, the limiting brackets prevent the forklift attachment from sliding toward the forklift and a shackle and chain prevent the attachment from sliding off of the fork tips. Attaching the Pinned Fork Rhino and Pinned Fork Rhino Receiver requires two (2) 17/32 inch holes to be drilled in the forks. The holes allow the holding pins to secure the fork-rhino to the fork truck. The Fork Rhino's design doesn't affect the safe operation or capacity of a fork truck. Automation Devices, Inc. produces vibratory feeders and components. They are located in Fairview, Pa. For a closer look at the Fork Rhino, please visit www.forkrhino.com. For more information, please visit the Web site or call Automation Devices, Inc. at 814-474-5561.